MZT Pumpi AD- Skopje will exhibit at the upcoming ACHEMA 2018 – the globally renowned trade fair and congress, dedicated to chemical engineering, biotechnology and environmental protection, which will take place from 11 – 15 June 2018 in Frankfurt am Main, Germany. Our specialists will be pleased to hear about your project needs and ideas and offer you our best solution. During this exhibition we will present our newest developments, offer you technical support, consulting etc. MZT Pumpi`s representatives move to the world’s largest exhibition for process, drinking and waste water! At this year’s Aquatech Exhibition we will be present with our top specialists, who eagerly will be expecting you to hear about your project needs and ideas. During this exhibition we will present to you our newest developments, offer you technical support, consulting etc. You can find our booth in the center of the Hall No.1, booth No. 01.523! MZT Pumpi will present itself at the ACHEMA 2015, 31th International Exhibition-Congress on Chemical Engineering, Environmental Protection and Biotechnology. This fair will be great opportunity for presentation of our Company and make new contacts with potential customers from different industry segments. Around 2.500 exhibitors have already registered for the upcoming ACHEMA 2015. We expect that next year this exhibition will be also very successful for us and MZT Pumpi will expand its presence on new markets. 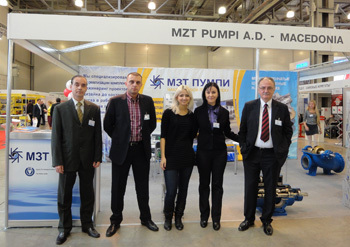 MZT Pumpi was present on the exhibition PCVEXPO-2013 held in Moscow— one of the biggest events in Russia and Europe, brings together producers and consumers of industrial pumps, compressors, pneumatics, valves, actuators, engines and seals. Over 340 exhibitors from 20 countries demonstrate the latest trends in hydraulic machines design, innovative compressor technique, pipeline valve and fittings, seals, actuators and engines. 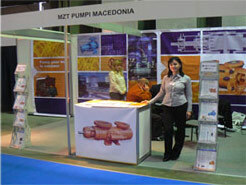 MZT Pumpi presents itself at the PCVEXPO-2012 —which is one of the most important events for the industry. Over 300 exhibitors from 20 countries demonstrate the latest trends in hydraulic machines design, innovative compressor technique, pipeline valve and fittings, seals, actuators and engines. Trade fair unites total range of pumps, compressors, valves, actuators and engines. 11th International Exhibition PCVExpo will be held 22–25 October 2012 in Expocentre, pavilions 1 and 5. 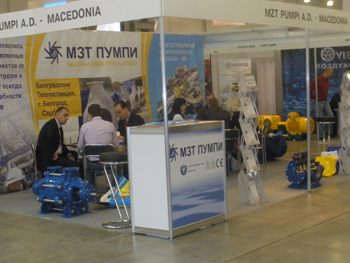 MZT Pumpi AD Skopje will present itself on the PCVExpo, one of the biggest events in Russia and Europe, brings together producers and consumers of industrial pumps, compressors, pneumatics, valves, actuators, engines and seals. In 2012 we introduce a new section at PCVExpo, Component Production. From 18th until 22th June 2012 MZT Pumpi presented itself at the 30th International Exhibition-Congress on Chemical Engineering, Environmental Protection and Biotechnology. MZT Pumpi was in Hall 11.0 at stand C59. This fair was a great opportunity for presentation of our Company and make new contacts with potential customers from different industry segments. Just as we have expected, this exhibition turned out to be very successful for us. We have realized many interesting meetings with engineering companies, distributors, end users, from water, chemical and petrochemical industries. 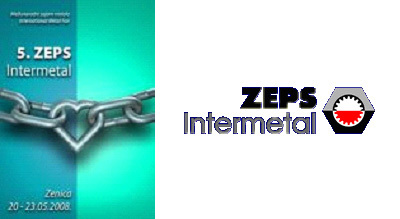 We expect that these contacts will materialize very soon and that MZT Pumpi will expand its presence on new markets. 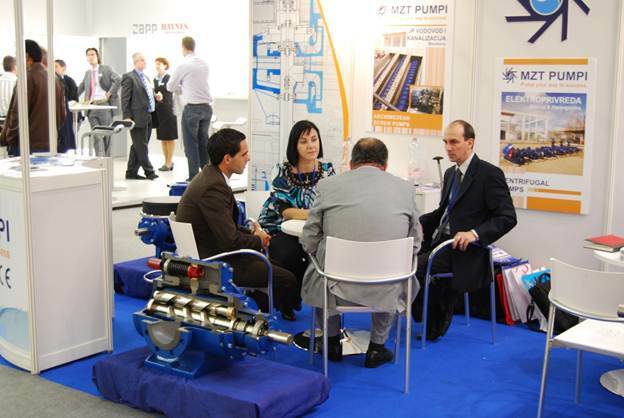 MZT Pumpi will present itself at the PCVEXPO-2011 — is one of the most important events for the industry. Over 300 exhibitors from 20 countries demonstrate the latest trends in hydraulic machines design, innovative compressor technique, pipeline valve and fittings, seals, actuators and engines. Trade fair unites total range of pumps, compressors, valves, actuators and engines. 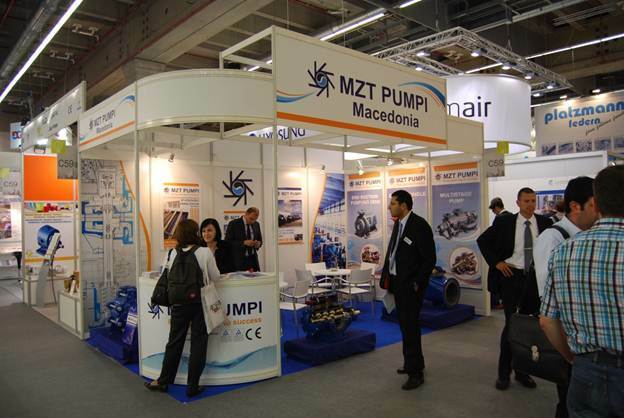 MZT Pumpi was present on the exhibition EXPOKOS FAIR held in Prishtina, Kosovo from 21-25 May, 2009. MZT Pumpi took participation at this Fair together with METALEX , realized more that 200 meetings with biggest and most important companies from different industry segments: Water supply, Energy and Mining, Civil Engineering, mostly from Kosovo and Albania. EXPOKOS FAIR in Kosovo is one of the most important Business events in Kosovo. It includes 4 pavilions: Construction, Energetic & Mining, Techniques and Wood Industry. More than 150 companies from Kosovo, Serbia, Macedonia, Bosnia, Croatia, Slovenia, Rumania, Turkey Bulgaria, Albania, Germany, Italy, Belgium, Greece and Austria were present as exhibitors this year. 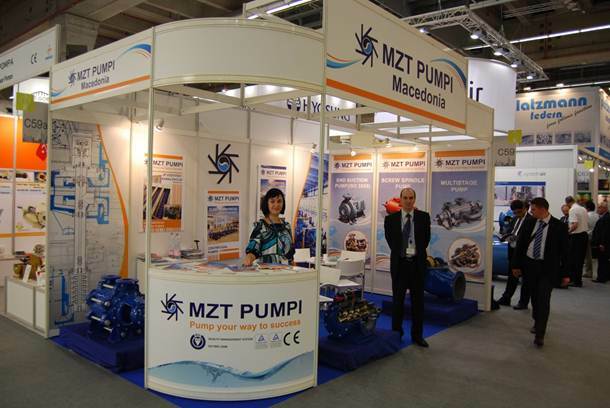 MZT Pumpi was present on the 53rd International Fair of Technique and Technical Achievements (UFI) which took place in Belgrade from 11-15 May, 2009. The International Fair of Technique and Technical Achievements is the most important economic and technological event in Serbia and the South East Europe, which has got a great influence upon the future industrial development in the country and region. Thus, the TECHNICAL FAIR is a venue visited by tens of thousands of professional visitors, decision makers, investors, experts etc. MZT Pumpi is already well established brand on the market of ex-Yugoslavian countries, this fair was mainly a place to meet our long-term business partners in order to present them our newest product developments and future projects. MZT Pumpi was present on the exhibition Pumps & Valves 2008 held in Antwerp from 15-17 October, 2008. Pumps & Valves is the most important exhibition in Belgium for pumps, industrial fittings, hoses and compensators. The visitors were from the following countries: 87% were from Belgium, 9% from the Netherlands and 4% from other countries. MZT Pumpi had realized many successful meeting on this fair, mainly with companies from Belgium. We believe that these contacts will help us to expand our international business. MZT Pumpi was present on the exhibition Aquatech Amsterdam 2008 held in Amsterdam from September 30 – October 3, 2008. Aquatech Amsterdam 2008 attracted more international visitors than ever before. This emphasizes the ongoing success in developing the Aquatech formula across three international exhibitions in Amsterdam, China and the United States. MZT Pumpi presented itself very successful on this fair. We have realized many contacts with companies from Benelux countries, as well as companies from other countries. We hope on future successful cooperation with many of them. We also got acquainted with the latest developments in the process, drinking and waste water market, which will certainly help us in shaping our future business and development strategy. This exhibition is specialized for metal and non-ferrous materials. This was our first time to participate and good opportunity to have meetings with other companies from South Eastern Europe but mostly from Balkan region and to introduce them with our production range. Recognition for the best Product at the Zeps Fair, System for Screw spindle pump „SVPF 10“ and Multistage centrifugal pump type „30 MSD80-5B“. Once again this was confirmation for the recognition of the quality of our products in Bosnia and Herzegovina and at the same time big opportunity and potential for their installment in many industry segments. This was 52st INTERNATIONAL FAIR OF TECHNIQUE AND TECHNICAL ACHIEVEMENTS (UFI). Belgrade Fair is the largest institution of its kind in Serbia. Our stand was visited from more than 500 visitors where we have opportunity to meet our long-term business partners and to represent our wide and rich production programe in front of new interested clients in area of metalic industry. This exhibition is specialized for Pumps, Compressors, Fittings, and Heat-and-power engineering international trade show. We have been visited from more that 400 visitors. Among all of them we can distinguish the visit by Minister for Comunal work and watersupply for Ukraine, Macedonian Ambasador in Ukraine, Manufacturing companies as well as Many trading and intermediary comapnies. 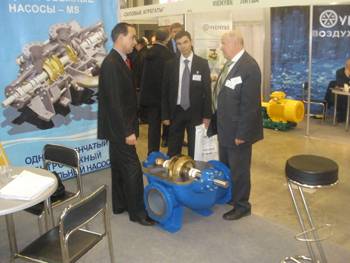 MZT Pumpi was present on the exhibition PCV held in Moscow from 15-18 of October, 2007. This is specialized exhibition for pumps, compressors, pneumatics, pneumatics tools, valves, actuators and engines brought together over 500 exhibitors, covered an area of 22.000 sq.m, and brought an outstanding business opportunities during its duration from 15-18 October,2007. 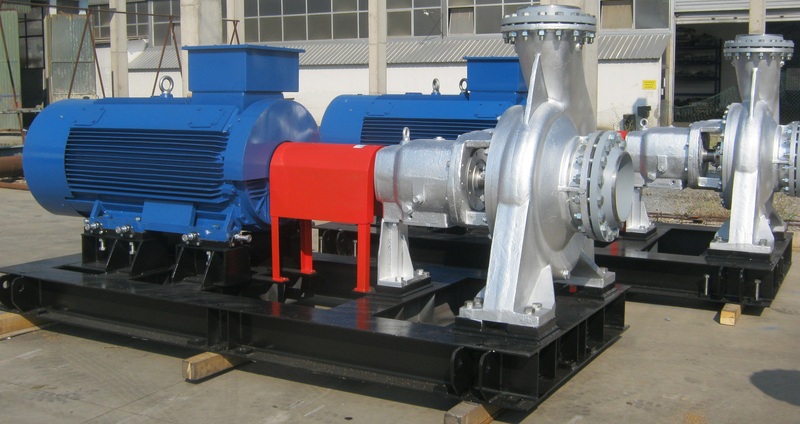 MZT Pumpi was situated in Hall 4.1, and it represented its extensive product range.